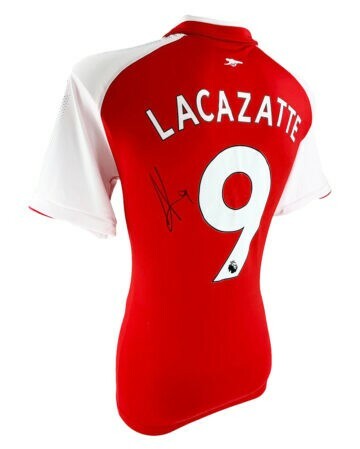 Shop for signed Arsenal football memorabilia including football boots, shirts, gloves and autographed photographs. Most items come with a photo of the signing, All Arsenal signed items come with a certificate of authenticity, free UK delivery and fast worldwide shipping. Arsenal football club was founded in 1886 as Dial Square – since then it’s been one of the UK’s most celebrated and keenly followed teams. The club hailed from humble beginnings as is the case with many of our premiership heavyweights, spending almost 90 years at the iconic Highbury before moving on up to the 59,900 capacity Emirates Stadium in 2006. They were the first Southern football team to join the Premier League back in 1893 – and since then they’ve dominated, claiming a total of thirteen league titles. Arsenal is known for its Premier League and FA Cup wins – notably their acquisition of Highest League Position in 2000, and their FA Cup League double in the 1970s. Their trophy cabinet is positively gleaming with silverware thanks to a record thirteen FA Cups, fifteen FA Community Shields and one UEFA Cup Winner’s Cup. The club’s reputation for quality and consistency has attracted players from all over the world including Theirry Henry, Dennis Bergkamp, Patrick Vieira and Tony Adams. The Gunners are loved all over the globe – with the fifth largest fan base worldwide. Forbes’ 2018 rich list estimated the club’s worth at $2.3 billion – the third most valuable in England. Fans dubbed the ‘Gooners’ are intensely loyal – and each match is a sell-out. Arsenal is the impressive holder of the second-highest average attendance of all European football clubs. As a result, signed Arsenal football memorabilia is naturally in demand – with fans worldwide wanting a slice of the club’s rich history to covet for themselves. Our iconic collection includes signed Arsenal shirts, footballs, boots, gloves and accessories. Our exclusive signed Arsenal footballs, shirts, boots & photos span the decades – from the early years to the present day.